Who? …What?… When?… Where? …Why? …How?…. A lot of people get confused when it comes to differentiating between the two. Some say that the protagonist is the good guy against the bad guy, who is the antagonist. Others conclude that the protagonist stands for what is right like a hero, while the antagonist is against what the protagonist stands for, similar to that of a villain. Both of them are correct but the problem is in on how it is being used. In movies, comics, cartoon series, we are almost always presented with the hero being the protagonist and we normally assume that whoever is against the hero, he must be the villain. But the protagonist and antagonist terms work for the hero, the villain and other archetypes as well. It is only a matter of perspective. The protagonist is the main character of the story – this can be either the villain or the hero. The antagonist is the one who stands against the protagonist – in the case where the villain is the protagonist, the hero, who opposes the villain is the antagonist. This is one of the unique take on storytelling and by placing the villain or other archetypes as the protagonist, you will be able to follow the storyline through a very different viewpoint. You will need your character to bring something new to the comic book genre, and ensure that their characteristic and abilities are memorable. Thinking about your characters personality is very important, and this can be in any direction that you want. You may want your character to be bold, or shy, evil, or good. There are many different personality traits that the character can have; however, they need to be believable. Despite being fictional characters, you may want to keep some sense of realism when creating them.We have, in other related articles, mention practicing exaggeration when drawing comic characters.Why not? Its fun, adds a certain uniqueness to the character and most certainly does not limit your art style. But keep in mind that adding more realism or anything that makes sense when creating a character can actually make the reader relates to a character evens better. As the character creation process goes on, you must also consider how you want the character to look in the future.Every adventure has their conclusion and every story ends.Being on the logical side of things, a character will not be looking the same as when he started off. But this is comic, not everything is logical! True. But as mentioned earlier, it is better to add some sense of realism when creating a character. Being logical is something that most people can relate to and your character progression is no exception. When clothing and other equipment can be worn-out, your character still ages even if not physically. His mentality grows and your character has a more mature perception. All the things your character has experienced in the past can influence his/her perception, thinking, decisions and ultimately how the character looks. It is always helpful to have different designs for a character in different environments or settings. Although your character is very likely to be the hero they will need weaknesses, and these can be anything. No one is perfect, and even the best comic book heroes can be defeated by something.Even Superman have weaknesses.Either physical or emotional, weakness can come in many form.Never make your comic character invincible.Invincibility or perfection can be perceived as boring and can even weaken the storyline. It is very difficult to create something entirely original, but is creating something new just as hard? When creating something original, a lot of research must be done so that the creation is not similar or the same as others of the type.In this day of age, we are expose too many different form of media, culture, history, and this makes it very difficult for us to create some original. We are not saying that you cannot create something original, but it is a very difficult and time consuming process. When you create something, be it a character or a story, you can be certain that if you trace back on how you get the idea, you will find that some of the influence to it are things that you have either seen, read or heard from somewhere.Some call it “inspired by” or “inspiration” but we like to call it “referencing”. One of the things that gets readers to get hooked to a comic besides the artwork and the plot, is the character’s detail or characters development.To make your comics work, never hope on the artwork alone to get people to follow your comic.Solid storyline, amazing artwork and of course, great characters are essential in making good comics.Working out the plot and timeline in place is one thing, but creating a believable character to that fits in the storyline is a different thing entirely.In order to get the character moving with everything else as the story progresses and at the same time creating a strong character development, you must start from the absolute basic – character creation. To start off the process of creating a character, you must be able to tell the readers what the character is all about.One of the simpler way to do this is by asking yourself these simple questions. Who is this character? Who is this guy/gal to everyone else? If this character has dual identity in similarity to the case of Batman or Spiderman, tell out the name of both the real name as well as the superhero name. What does this character do in the story? What is the character capable of? If there is any change of event, what is this character before and after the changes? What are the powers of this character.What is this character’s purpose? The timeline when the story takes place. This is usually the place where the event that changed the character took place.The origin of your character. This is where it’s going to take some time. The “why” is basically a background story for your character.This summary is where you can explain details of your characters.You can also point out his/her perception, motivation and goals if you want.and how he/she like to handle things. This is where you can explain on how your character likes to handle things or point out how the character changed after an accident or how the character’s power works.It is alright if you have already mentioned some of the details in the “why” section. With the six questions above, you can basically create your very own character from scratch and actually have a basic understanding of what the character is all about.With this, whenever anyone ask you about a character you created, you can easily tell them about it.The point is to have a basic idea of your character that you agreed on and is believable or understandable by others as well. Most would think that the coloring part of comic creation is an easy process. In some cases, it is, but the problem can actually start before you start coloring. You must start at the absolute basic of it which is deciding on the colors – ignore this and you can expect a lot of bumps and hiccups along the way. The coloring process includes color schemes, inked drawings, flat colors as well as highlighting. We will not be going into all that now. (We will be doing that in the step-by-step comic creation process – the coloring section). There is a lot of things to consider when choosing the right color for your character(s). From the color of the skin, hair, eyes, clothing, gadgets, accessories, and much more. But before you decide on which color to use for any of these, have a look at the complementary color wheel below. Complementary colors are different sets of colors that “stands out” from another set of opposite colors or a color that “complements” and works well with another opposite color. In the color wheel, yellow is the opposite of purple, green the opposite of red, which means that yellow works well with purple and helps makes the object with the color “stands out” more. Same goes with the green and red. This is because the complementary colors are not of same color values.Lets see how this works. This is a normal apple tree. We can clearly see the red apples hanging among the leaves. This is because the red apples does not have the same color values as the green leaves and being the complementary colors of each other the few red apples are separated from the bulk of the green leaves.If the apples were to be green, it would be difficult to see them because they have related color values. Here is another example. If we color the clothing of the character red and color the background wall with orange we can see that the clothing is somewhat blending in with the background wall, this is because these colors are related color values. Now lets change the color of the clothing to blue and now you can see that the character does not appear attach to the wall anymore.The advantages of complementary coloring helps the character “stand out” from the background with just a simple step. Deciding on the colors first helps you figure out which part of the character you to give out more for people to see.This usually involves several colors, more if you include shading ( maybe a bit less if your character is a superhero). 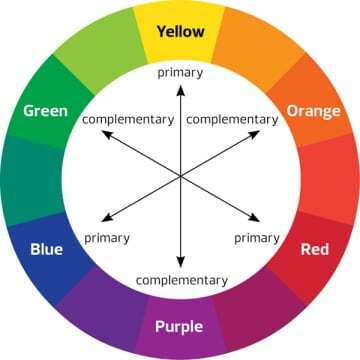 The image of the complementary color wheel above covers mostly the basic colors.If you are looking for more detail on complementary colors, head on to colorschemedesigner.com. Color Scheme Designer.com has a better and more detailed color values that you can work with and you can also adjust the themes to what suit you best. 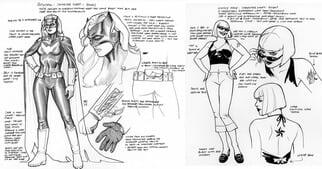 For more on coloring comics – CLICK HERE.